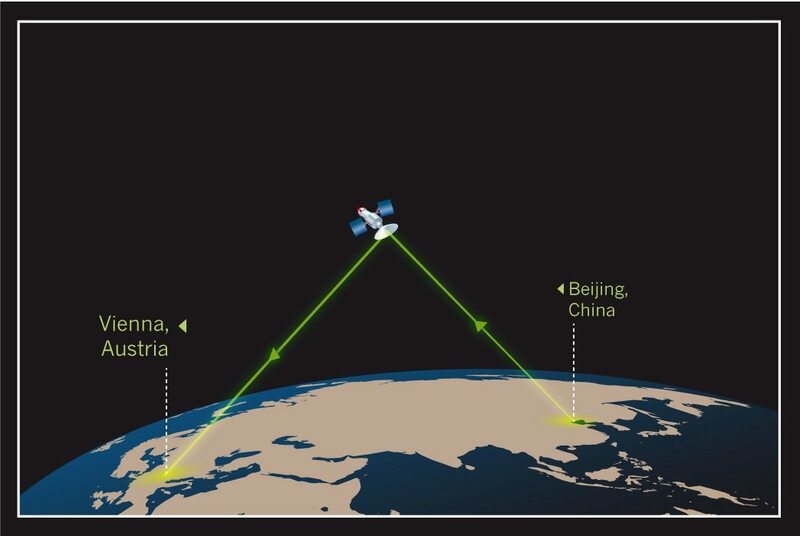 China recently launched a satellite to test quantum entanglement in space. It’s an interesting experiment that could lead to “hack proof” satellite communication. It’s also led to a flurry of articles claiming that quantum entanglement allows particles to communicate faster than light. Several science bloggers have noted why this is wrong, but it’s worth emphasizing again. Quantum entanglement does not allow faster than light communication. This particular misconception is grounded in the way quantum theory is typically popularized. Quantum objects can be both particles and waves, They have a wavefunction that describes the probability of certain outcomes, and when you measure the object it “collapses” into a particular particle state. Unfortunately this Copenhagen interpretation of quantum theory glosses over much of the subtlety of quantum behavior, so when it’s applied to entanglement it seems a bit contradictory. The most popular example of entanglement is known as the Einstein-Podolsky-Rosen (EPR) experiment. Take a system of two objects, such as photons such that their sum has a specific known outcome. Usually this is presented as their polarization or spin, such that the total must be zero. If one photon is measured to be in a +1 state, the other must be in a -1 state. Since the outcome of one photon affects the outcome of the other, the two are said to be entangled. Under the Copenhagen view, if the entangled photons are separated by a great distance (in principle, even light years apart) when you measure the state of one photon you immediately know the state of the other. In order for the wavefunction to collapse instantly the two particles must communicate faster than light, right? A popular counter-argument is that while the wavefunction does collapse faster than light (that is, it’s nonlocal) it can’t be used to send messages faster than light because the outcome is statistical. If we’re light years apart, we each know the other’s outcome for entangled pairs of photons, but the outcome of each entangled pair is random (what with quantum uncertainty and all), and we can’t force our photon to have a particular outcome. The reality is more subtle, and vastly more interesting. Although quantum systems are often viewed as fragile things where the slightest interaction will cause them to collapse into a particular state, that isn’t the case. Entangled systems can actually be manipulated in a variety of ways, and you can even manipulate them to have a specific outcome. I could, for example, create pairs of entangled photons in different particular quantum states. One state could represent a 1, and the other a 0. All my distant colleague needs to do is determine which quantum state a particular pair is in. But to do this my colleague would need to make lots of copies of a quantum state, then make measurements of these copies in order to determine statistically the state of the original. But it turns out you can’t make a copy of a quantum system without knowing the state of the quantum system. This is known as the no-cloning theorem, and it means entangled systems can’t transmit messages faster than light. Which brings us back to the experiment China just launched. The no cloning theorem means an entangled system can be used to send encrypted messages. Although our entangled photons can’t transmit messages, their random outcomes are correlated, so a partner and I can use a series of entangled photons to generate a random string we can use for encryption. Since we each know the other’s outcome, we both know the same random string. To crack our encryption, someone would need to make a copy of our entangled states, which can’t be done. There are ways to partially copy the quantum state, which would still improve the odds of breaking the encryption, but a perfect copy is impossible. So entanglement doesn’t give us faster than light communication, but it may make it a bit easier to keep our secrets secret. Thank you. I have never found an adequately explained reason for this that wasn’t a little bit too technical for my level of comprehension. They all just basically chalked it up to quantum uncertainty and assumed the reader could derive the rest of the explanation for there. You have done a wonderful job of clarification for a layperson like myself. Kudos. I still wonder if there is a possibility of achieving faster than light communication via quantum entanglement; not through the particles ( the outcome is statistical ) but using the meaning of the measure itself. Let me provide an imaginary experience: a spaceship leaves earth with 2 sets of entangled particles, “A” and “B”, ( their counterparts remaining safely on Earth ). After many many years, the spaceship arrives to one of our neighbouring stars and examines its planetary system. If a planet within this system has habitability conditions, a measure will be made on set “A”; if not, on set “B”. Would the measure be identified instantly on Earth? The thing Alex, is that measurement is completely random, if you measure 1 of your entangled particles, you’ll get either of 2 polarizations and will have absolutely no control over which 1 is produced, so if you measure your particle, the folks here on earth will not have a clue if you measured A or B. Set up a detector to detect when a particle has been observed. Observe particles constantly until destination reached. Many at once. Then astronaut unobserves and reobserves them all. Voila. Simple arrived ok msg sent faster than light. What about a system of indirect communication, or said another way, determinism? A pair of entangled particles are separated by light years, and prior to separation, an agreement was reached that upon a measurement yielding one state, each would perform one action. Upon the other state, they would each perform an alternative action. With two possible actions to take on each end, neither could otherwise perform their action with the confidence that the other’s action corresponded to their own.